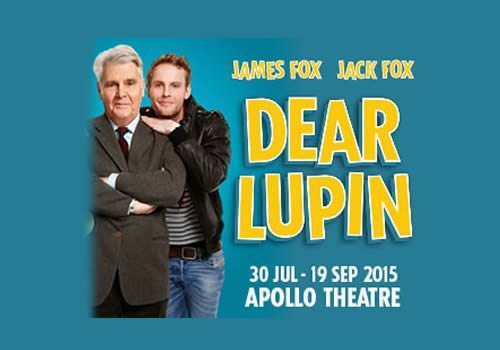 Following a tour of the United Kingdom, Dear Lupin is set to arrive at the Apollo Theatre with preview performances beginning from 30th July 2015. Dear Lupin is a real life account of the relationship between a father and son told over 24 years in Roger Mortimer's bestselling book. The text has now been adapted for the stage and the show will star real life father and son James and Jack Fox. Former Sunday Times racing correspondent, Mortimer, compiled Dear Lupin from letters between himself and his son, Charlie, who is nicknamed "Lupin." Spanning three decades, the letters begin as Charlie is on the cusp of expulsion from Eaton at age 15. The show continues to document the paternal relationship between the pair during Charlie's stints of rebellion, up until he is a fully grown, responsible adult. Philip Franks directs the Fox's in Dear Lupin, with designs by Adrian Linford, Sound by sound by Matthew Bug and lighting by Johanna Town. Dear Lupin promises to be a touching and enjoyable evening that would appeal to anyone interested in family bonds. Dear Lupin is not aimed at children and, due to it's use of language and adult references, is not suitable for youths under the age of 12.